Nathan Duwe with early morning Delavan Lake Crappie. Panfish in Spring can be some of the best of the year, big and plentiful. My favorite lakes in Southern Wisconsin are Delavan Lake and Lake Geneva, both are in Walworth County. Both lakes are very clear and warm more slowly than a murky or shallow lake. Warm sunny days tend to make the panfish more active. I find that the afternoon bite is usually better after the water has had the full effect of the daytime sun. Look for the fish in the shallows of the particular lake you are fishing. Usually I will choose areas with a dark bottom with green weeds. The dark bottom absorbs the heat of the sun raising the water temperature. The green weeds provide cover for the newly hatched microorganisms which are the major food source for the panfish, while also adding oxygen to the water. Brown or dying weeds emit carbon dioxide to the water and large concentrations can suffocate the panfish. Panfish prefer stable weather in spring and fluctuating temperatures will move the fish from the shallows to deeper waters making them more difficult to pattern. I will start my search for bluegills in 2-3 ft of water, sometimes they are in even less than 2 ft. The basic ice fishing set up is all that is required. Use a small bobber and a small ice jig. My favorite jig is the Lindy Toad in orange or chartreuse tipped with spikes or wax worms. An ultra light spinning combo spooled with 4 lb Silver Thread is preferred. On windy days a longer pole is necessary to allow the angler a better hook set percentage. A long pole allows you to get the bow out of the line due to the wind and get a solid set. Make long casts, fishing slowly; retrieve about a foot of line at a time, pausing to allow the jig to settle. The bite can be very subtle, hardly moving the bobber. Any extra resistance requires an immediate hook set. The bluegills are in pre-spawn mode at this time of year so don't over harvest the larger fish that need to spawn to sustain the fishery. Crappies are a little more difficult to pattern, due to the fact that the weather changes can really make them nomadic. I start in 4-6 ft of water and if needed deeper from there. When crappies are in pre-spawn, the smaller male fish move up first with the females hanging in the deeper water. I start in a shallow weedy bay of the lake. On Delavan Lake, it is normally Viewcrest Bay and on Lake Geneva, I like Trinkes. Being as nomadic as crappies can be, I will drift with the wind until I find some active fish. Once feeding crappies are located, I will anchor. After they stop biting I continue the drift. Due to the water clarity, making long casts are critical. Bait selection is a hair jig or small plastics, my preferred colors are purple or chartreuse, fished beneath a bobber. Suspend the jig two or three feet below the water surface or a foot or so above emerging weeds. It is very infrequent that I will use live bait. If you need to use it, try a Thill slip-bobber rig tipped with a crappie minnow also fished above the weeds. Similar to the bluegills, the retrieve needs to be slow with many pauses. A spinning combo is again the gear choice to be made with clear 4 lb Silver Thread line. Though crappies and bluegills are a month away from spawning, yellow perch spawn right after the ice is out. Typically they spawn when the water reached 45 degrees compared to the high 60's for crappies and bluegills. My favorite perch destination is Lake Geneva with its large population of aggressive biters. Different from the bluegills and crappies I find perch in 2-8 ft of water on hard sand or gravel bottom with scattered weeds. The presentation I prefer is a Thill bobber, plain hook and a minnow. On Geneva, it seems that the bigger minnow, the bigger the fish. Experiment on your body of water and see what produces best for you. Clear water makes long casts a necessity. I accomplish this using a 6'6" light action Fenwick rod, teamed with a Mitchell reel with 4-6 lb test Silver Thread line. Panfishing in early spring can also be productive for shore anglers. The fish are in the shallows close to land and readily accessible. 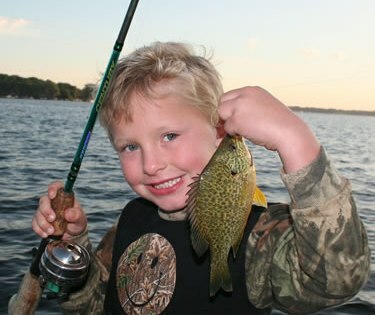 Both Delavan and Lake Geneva have shore fishing opportunities. Actually, there have been several times when shore anglers have done better than those of us in the boats. Stay close to home and avoid the walleye crowds and catch the first panfish bite of the year.